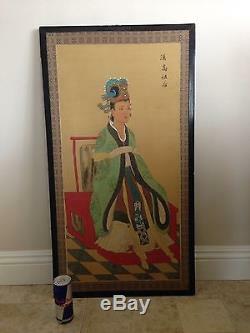 Up for sale is this magnificent fine old and original Chinese silk painting of an imperial wife of Han Guo Zhou. It has exceptional fine detail and bright colors and is signed in the upper right corner. This is a large mounted painted on black lacquer wood frame with etched copper details on the corners and copper studs lining the sides. 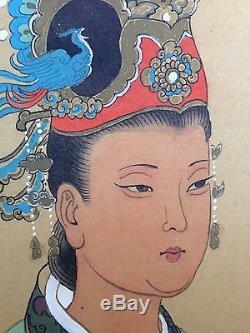 The painting shows the empress in a gorgeous imperial robe and headdress, seated in an imperial red chair. She is beautiful and the painting looks much better in person. The piece is quite old and likely dates to the late 19th, early 20th century and was recently acquired from a fine Chinese estate collection of fine antiques. It is in excellent condition with some minor wear on the frame and a minor spot stain by the signature and in the bottom right corner (very minor). Expected wear but makes a great large display. Measures 19" inches wide and 35" inches long. Well mounted and sturdy piece. 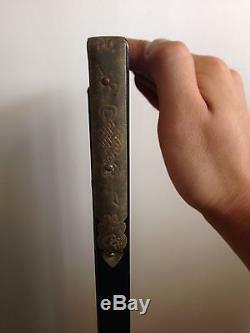 Please enjoy all the photos provided and feel free to browse my other antique Chinese items from the same estate. 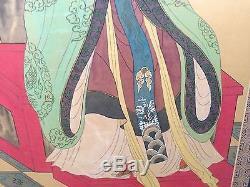 The item "19x35 LARGE Fine Old Chinese Silk Painting SIGNED Imperial Wife Han Guo Zhou WOW" is in sale since Friday, October 24, 2014. This item is in the category "Antiques\Asian Antiques\China\Paintings & Scrolls".